His Holiness Patriarch Mor Ignatius Aphrem II arrived at Muscat International Airport for a pastoral visit to our Church in Oman. He was accompanied by their Eminences Mor Clemis Daniel Kourieh, Metropolitan of Beirut, and Mor Timotheos Matthew, Patriarchal Secretary for Indian Affairs, as well as Very Rev. Raban Joseph Bali, Patriarchal Secretary and Media Office Director. His Holiness and the accompanying delegation were received at the airport by His Eminence Mor Ireneos Paulose, Patriarchal Vicar in Oman, Sheikh Noman Bin Hareth Al-Amiri, Sheikh of Al Seeb city, representing the government of Oman, Sheikh Ahmed, Deputy Minister for Religious Affairs at the Ministry of Endowments in the Sultanate of Oman, Commander Thomas Alexander, and Dr. Renji. His Holiness Patriarch Mor Ignatius Aphrem II met His Excellency the President of Lebanon General Michel Aoun at the Presidential Palace in Baabda. His Holiness was accompanied by their Eminences Mor Theophilus Georges Saliba, Archbishop of Mount Lebanon and Tripoli, and Mor Timotheos Matthew, Patriarchal Secretary for Indian Affairs, and Very Rev. Raban Joseph Bali, Patriarchal Secretary and Media Office Director. During the meeting, His Holiness conveyed to His Excellency the love of our Syriac Orthodox Church to Lebanon, and their support to the efforts that His Excellency is making to keep Lebanon safe and secure. His Holiness also invited His Excellency to participate in the Inauguration of the new Patriarchal Residence in Atchaneh – Lebanon during June, in the presence of their Holinesses and Beatitudes Patriarchs of the sister churches. His Holiness Patriarch Mor Ignatius Aphrem II received His Eminence Armash Nalbandian, Armenian Orthodox Archbishop of Damascus, and Very Rev. Fr. Garegin Hambardzumian, Dean of Gevorkian Theological Seminary coming in Holy Etchmiadzin – Armenia, at the Patriarchal Residence in Atchaneh – Lebanon. 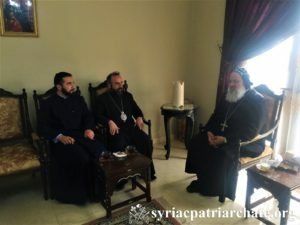 During the meeting, His Holiness discussed with his guests ways of collaboration between the Armenian Seminary and our Syriac Orthodox Mor Aphrem Theological Seminary. Very Rev. Fr. Garegin will visit in the coming days our seminary in Maarat Saydnaya for this purpose. The meeting was attended by Very Rev. Raban Joseph Bali, Patriarchal Secretary an Media Office Director. His Holiness Patriarch Mor Ignatius Aphrem II received, in his residence in Bogota – Colombia, His Excellency Archbishop Oscar Urbina Ortega, President of the Catholic Bishops Conference in Colombia, along with the secretary of the Conference. His Eminence Mor Yacoub Eduardo Aguirre, Archbishop of Central America, and Very Rev. Raban Joseph Bali, Patriarchal Secretary and Media Office Director, attended the meeting. His Holiness thanked his guests for their support to the Christians in the Middle East. He also discussed with them several issues concerning our church in Colombia. His Holiness assured that our church is there to serve and minister to the people, not to proselytize. He also asked the conference’s support to the very small communities our church has in Colombia. 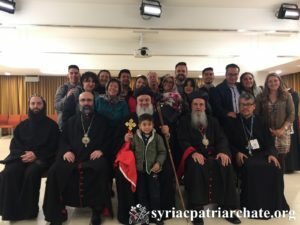 His Holiness Patriarch Mor Ignatius Aphrem II met, with representatives of the communities of the Syriac Orthodox Archdiocese in the province of Bogota in Bogota – Colombia, in the presence of their Eminences Mor Yacoub Eduardo Aguirre, Archbishop of Central America, Mor Chrysostomos Mikhael Chamoun, Patriarchal Vicar and Director of the Patriarchal Benevolent Institutions in Atchaneh, and Very Rev. Raban Joseph Bali, Patriarchal Secretary and Media Office Director. During the meeting, His Holiness discussed with his esteemed guests issues related to the church in Central America, especially in Bogota. His Holiness Patriarch Mor Ignatius Aphrem II met with representatives of the clergy of the Syriac Orthodox Archdiocese of Central America in Colombia in the presence of His Eminence Mor Yacoub Eduardo Aguirre, Archbishop of Central America. During the meeting, the clergy presented to His Holiness the various programs and activities aiming at serving the parishes as well as their missionary work. His Holiness listened to their concerns and gave them spiritual guidance for the good of the church of Central America. 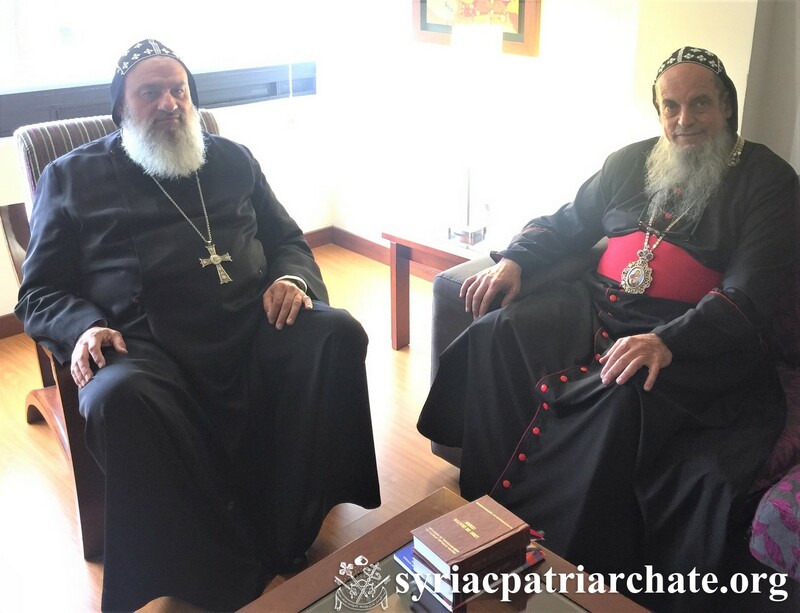 His Holiness Patriarch Mor Ignatius Aphrem II met His Eminence Mor Yacoub Eduardo, Archbishop of Central America, during his visit to Colombia. His Holiness discussed with His Eminence the situation of the churches and missions of our Syriac Orthodox Church in Colombia. In his speech, His Holiness considered that the two archbishops of Aleppo “presented no threat to anyone. As disciples of Christ, called by Him to tend His sheep, they were fully dedicated to their mission. Their care and compassion went beyond their immediate flock. It was extended to the community at large regardless of their religious affiliation, which earned them the love and respect of the entire society in Aleppo.” He added that despite the negative impact on the Christian community in Aleppo, “even after five years of their abduction, the Christian community in Aleppo – although greatly reduced by numbers, remains steadfast in its faith in Christ.” His Holiness then invited the audience to watch a 3-minute video about the two Archbishops. His Holiness then spoke about the suffering of Christians in the Middle East, and his continuous visits to comfort them since his installation in 2014. He then condemned the “low state of affairs which our world has reached”, referring to the recent attack on Syria by the U.S., U.K. and France. 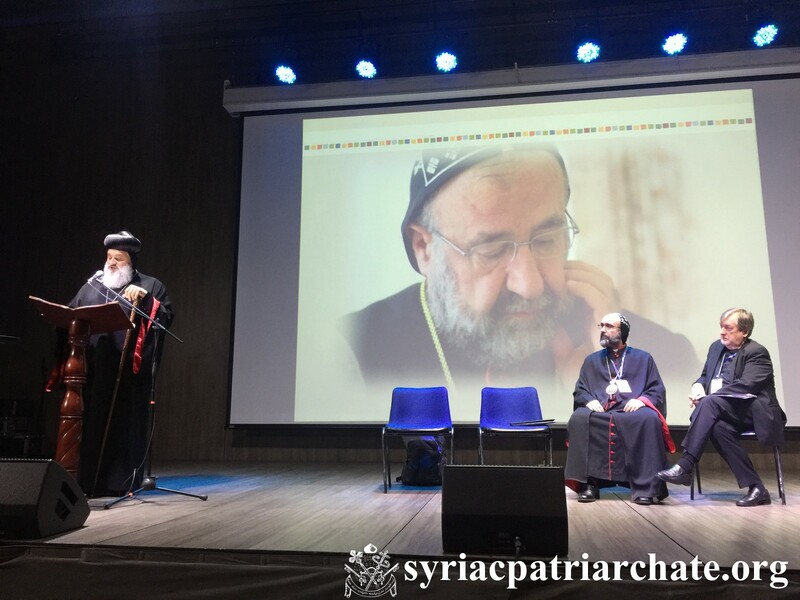 During the session, two members gave tributes to Mor Gregorius Youhanna Ibrahim, who was a founding and active member in the GCF, on the occasion of the 5-year anniversary of his abduction along with Archbishop Boulos Yaziji. His Holiness Patriarch Mor Ignatius Aphrem II participated in the morning prayer and opening plenary session at the 3rd Global Gathering in the Global Christian Forum entitled: “Let mutual love continue” (Hebrews 13:1) – Bogota, Colombia. His Holiness was accompanied by their Eminences: Mor Coorilose Geevarghese, Metropolitan of Niranam, and Mor Chrysostomos Mikhael Chamoun, Patriarchal Vicar and Director of the Patriarchal Benevolent Institutions in Atchaneh, as well as Very Rev. Raban Joseph Bali, Patriarchal Secretary and Media Office Director. His Holiness will present at the forum a speech about following Christ together in discrimination, persecution and martyrdom. 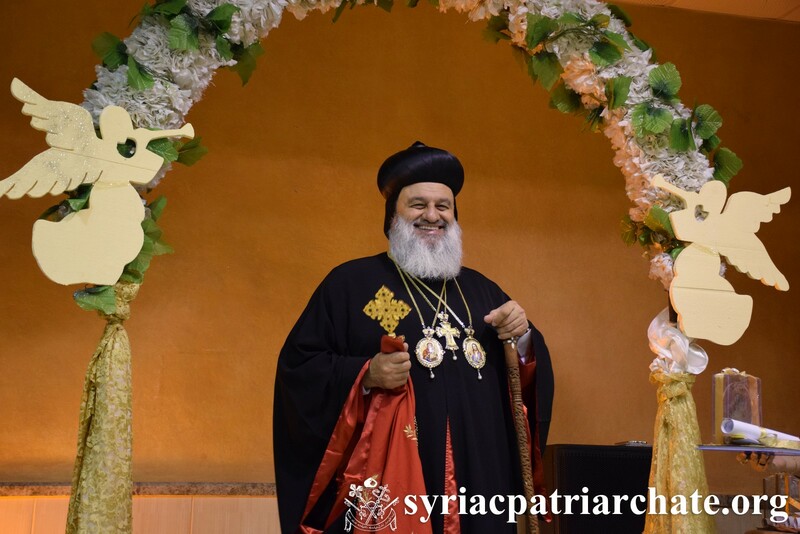 His Holiness Patriarch Mor Ignatius Aphrem II celebrated the Holy Qurobo and the Ceremonial Communion at St. Georges Church in Al-Suryan area in Aleppo. 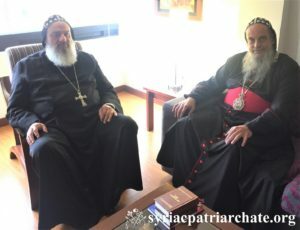 Their Eminences Mor Selwanos Boutros Al-Nemeh, Archbishop of Homs, Hama and Tartous, and Mor Timotheos Matta Al-Khoury, Patriarchal Vicar in the Patriarchal Archdiocese of Damascus, assisted His Holiness in the Qurobo. Very Rev. Raban Boutros Kassis, Patriarchal Delegate in Aleppo and Environs, as well as monks, priests and deacons served the Qurobo. In his sermon, His Holiness explained the Gospel of the Qurobo. He considered that “if we have faith in the Lord, we shall have good part with Him, for He gives abundantly to those who believe in Him.” His Holiness added “life near Christ gives us luminous eyes for He is the True Light.” The apostles didn’t know the Lord because they went away from Him, His Holiness added. 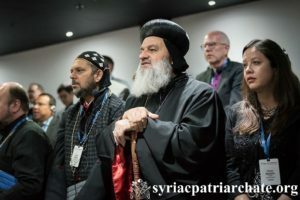 He then spoke about the two abducted bishops; he said: “we wanted to be with you today, which is a hard day for the beloved faithful in Aleppo.” He assured that “We let no day pass without praying for the sake of the bishops; thousands are united with us in this prayer, faithful of various churches, and international organizations.” His Holiness noted the hard work of the Patriarchal Delegate in Aleppo, as well as all the priests, councils, and church organizations in the service of the Archdiocese; however, His Holiness considered that the absence of Mor Gregorius Youhanna Ibrahim has had a great influence on the Archdiocese. His Holiness then congratulated the children participating in the communion, and instructed them to stay close to God and lead a life of holiness. During the Holy Qurobo, the common statement issued by His Holiness our Patriarch and His Beatitude Greek Orthodox Patriarch of Antioch and all the East John X, for the 5-year commemoration of the two abducted archbishops.